On May 22, we released Version 6.2 of Wild Apricot. The release came with two significant improvements, as well as a number of bug fixes. The first improvement you'll see is the ability to manage all your admins in one place. This screen is found in the Account menu in the upper right corner of the admin view. 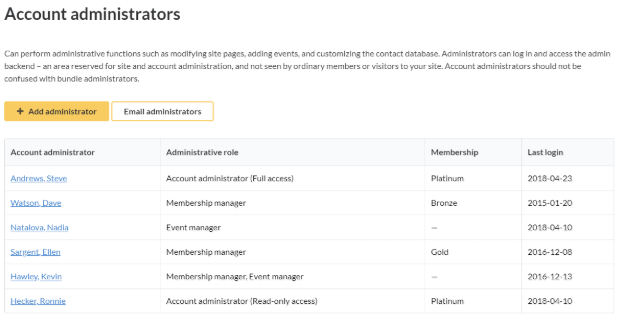 For more information on adding, viewing, modifying, removing, and emailing account administrators from the Manage account administrators screen, click here. 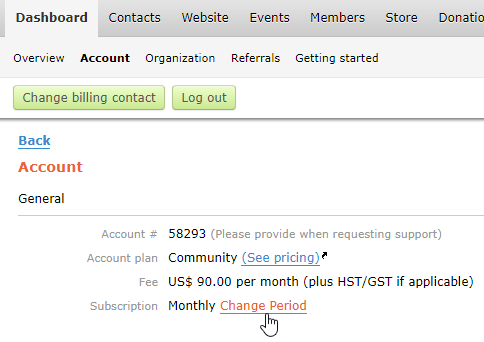 The second improvement with Version 6.2 is the ability to change your billing period from monthly to yearly yourself. If you’d like to do this, simply go to the Account screen under Dashboard. You will see an option to Change Period (screenshot below), which will give you the option of changing from monthly to yearly billing (for a discount of 10%), or every two years (for a discount of 15%). Note: This self-service option for changing your subscription period is only available for monthly accounts and is not available for locked in, or overdue accounts. To change back to a monthly plan, or to switch between yearly, or every 2 years, please email billing@wildapricot.com. If you decide to change your billing period, you'll be asked to choose a new subscription period and to confirm the change. Once you confirm the new subscription period, we'll send you a summary of the account change to your billing contact. On your next monthly renewal date, you'll be charged the annual, or 2-year fee you chose. To see all the bug fixes, and more details on the two improvements with Version 6.2, click here. It’s been two months since we released the online store and we’re seeing it put to good use on many sites. If you would also like to add an online store to your site, here are the step-by-step instructions to do so. You likely received many emails from organizations updating their privacy policies last week (us included). That’s because on May 25, the European Union began enforcing their new data protection regulation, the General Data Protection Regulation (GDPR). The GDPR regulates the collection and storage of personal data for EU residents (including UK residents), regardless of where the organization doing the collecting is located. Have you ever wondered whether advertising on Facebook could help you grow your organization? If so, please join our free webinar on June 26 with our in-house digital marketing expert, Farhad Chikhliwala. Farhad will draw on his many years of Facebook advertising success to show you how you can use Facebook’s ad platform to attract and engage more members. Are you thinking of changing your membership levels? This month we analysed over 50 membership websites to figure out what the most common membership levels and payment options are. You can find all the results here.